Three actors accept an invitation to a Mexican village to perform their onscreen bandit fighter roles, unaware that it is the real thing. An all too uptight FBI agent must protect a larger than life mobster with a heart of gold, currently under witness protection in the suburbs. Con artist Gwen moves in to Newton's empty home without his knowledge and begins setting up house, posing as his new wife. Film noir parody with a detective uncovering a sinister plot. Characters from real noirs appear as scenes from various films are intercut. C.D. Bales: Dixie! Hi, how you doing, girl? Yeah, I'm on my way. I'll be there in about five minutes. I'm bringing it! I've only had it a year and a half, I told you I'd return it. OK. So long. Talk to you later. All right. All right. Bye. I have to admit that this was a nice and sweet version of Martin's interpretation of Cyrano de Bergerac. It was nice to see a little comedy into the story. I know of the story, but have seen none of the movies. So, this is pretty much as close as I will get to the story even though my mom has the old version of Cyrano de Bergerac, it doesn't look that entertaining. Steve plays Charlie, a kind and funny fireman with one little... well... actually huge thing on his face, a very long and big nose. 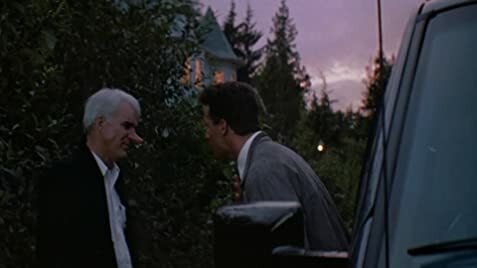 But he ends up meeting Roxanne, a very beautiful woman who is a rocket scientist and just wants be romanced, she meets another man, Chris, very handsome, but doesn't exactly have a way with words. Charlie has a huge crush on Roxanne, but she's attracted to Chris, Chris also has a thing for Roxanne, so through the hardest times, Chralie helps Chris try to woe Roxanne with his words going through Chris's mouth. It's a very sweet and romantic movie with some good little laughs here and there. 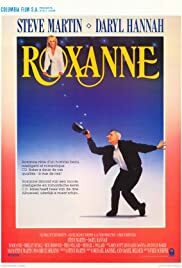 I think this is an under rated Steve Martin movie that I think everyone could give a chance too. Because, let's face it, we all have that little imperfection that can always be seen as unique and beautiful in the eyes of other's.